Volunteers, staff, friends and family, as well as local dignitaries, recently attended the Light House’s Inaugural B.E.S.T. Graduation in a ceremony to celebrate the successful completion of the program. In addition to providing shelter to individuals and families, the Light House has expanded programming to include a series of twelve-week job training programs (B.E.S.T. -Building Employment Success Training). The disciplines of the B.E.S.T program include Administrative, Janitorial and Culinary Arts. Plans are to expand the program this spring to include Retail and Landscaping. Residents of the Light House must qualify to participate in the hands-on and internship training program that incorporates daily classes in basic and life employment skills while working in their discipline, all under the supervision of a job coach. The Light House shelter celebrated the graduation of ten B.E.S.T students – one in the area of Administration, five in the area of Culinary Arts Training and three in the Janitorial/Maintenance Services. Seven graduates participated in the ceremony. The other three were not able to attend. Our job at the Light House is ask what happened and to help you sort out the path back to the life you want to lead. We do not judge the events that led you to our doors, we invest in creating opportunities that will lead you to standing taller and prouder as you walk out our doors…You have shown the dedication, openness, willingness and team spirit. You have kept the motivation that it takes to make anything worthwhile happen in life. You have passed the required testing, the required learning and the required homework. You have also done the self reflection necessary to grow. We are so proud of you! The B.E.S.T program was started in 2010 through a grant from the “Ladders to Success” program through the Community Foundation of Anne Arundel County. It has grown into one of the Light House’s core programs to build job training skills that will lead to sustainable employment for the residents. Additional funding for the B.E.S.T program has come from the Hussman Foundation, Marion I. and Henry J. Knott Foundation, Friends of the Light House shelter and the Northrop Grumman Employee Fund. The Culinary Arts training is led by Executive Chef Linda Vogler, who took the position in September 2011. Although only a short time on the job, she already has a clear vision of what she wants to accomplish. “The Culinary Arts field is a second chance industry. It is portable and the sky’s the limit if you work hard,” she said. “Opportunities are available at the entry level in places like hospitals, nursing homes, schools, restaurants and catering. I want to prepare our students for sustainable employment” she added. Chef Linda teaches the culinary students basic cooking skills including preparation, knowledge of food and safe food handling, time management and kitchen equipment training. During their hands-on training, the students also prepared meals and catering special events at the Light House. Vogler has joined the Chesapeake Chefs Association, a 20-year partner with the Light House. Of the ten students who graduated from the B.E.S.T program, six have secured employment in their respective disciplines and one is attending technical school. Developing employer partnerships within the community is the key to the success of this program so that job opportunities are available for clients upon completion of the training. For more information about the B.E.S.T. program, please contact Kristy Blalock at 410.349.5056 or [email protected]. 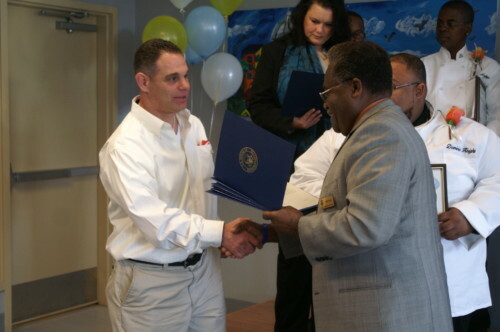 Top: Roger Marcus, Janitorial Services is congratulated by Lt. Beans, Community Relations, Office of Congressman John Sarbanes. Bottom: Elizabeth Kinney, Executive Director congratulates Bonita Nutter, Culinary Arts graduate.